There are three possible endings in the Blood and Wine expansion for the Witcher 3. In this guide I'll explain how to get each of the endings, which story and dialogue choices to make and also reveal which ending is the best. Like in the original game, your actions will either reduce or expand dialogue choices, quests and other character events. Making good choices will lead you down a path that ultimately concludes with the good ending but it's still possible to make small mistakes along the way. In particular, in Blood and Wine there are a couple of small and not so obvious events that will lock you out of the ending permanently. Note: This post contains some spoilers but I have tried to conceal as much as possible. If you've just started playing the DLC you may want to bookmark this post and return after your next NG+ run through. Rather than telling you outright what happens, I have HIDDEN the ending descriptions at the bottom of this post. Click the link to reveal the text if you want to know exactly what happens during the final cutscenes. Close to the end of the Blood and Wine story Geralt is given a journal with 5 -6 entries in it. If you don't read all of the entries then you are locked out of the best ending immediately! Unless you have a save game point, you won't be able to return and make up for your mistake. This journal is the main reason why most people miss the best ending, even if they make good choices elsewhere. To give you more of a clue: the journal helps Geralt learn that Syanna and Henrietta were both mischievous sisters, but Syanna was to blame for most of their tricks. Overall they had a good sister relationship up until Syanna was banished. 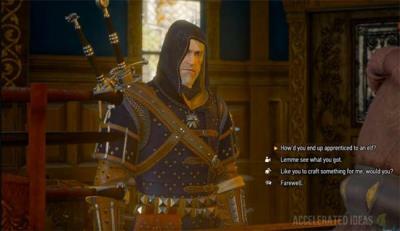 This gives Geralt the option to be more persuasive later in the story. It's important to note that you receive the book in your inventory but reading it outside of the dialogue doesn't work. You MUST read it when you originally find it. If you're not sure when this is, it's when you're with Regis, right before you enter the fairytale land. The good ending is mostly decided during the "Pomp and Strange Circumstance" quest which takes place after Detlaff is defeated and the Duchess sets up the trial for Syanna. When this quest starts, you only know of four victims but begin to wonder about the fifth. New optional objectives appear but importantly you must speak to the bootblack (the shoeshiner who provided information about Detlaff previously), locate the shelter and then defend it. After these events have taken place, the final target is revealed and new optional objectives come into play. Now find where Syanna is locked up and convince the guard to let you talk to her. 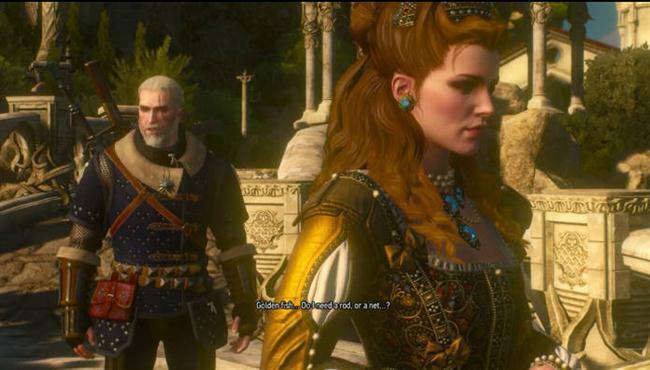 Geralt will enquire about her plot and a dialogue conversation takes place. "Ever thought to forgive her?" After the conversation, go to the ceremony and accept your reward. There's another choice to make here. Choose the option "Got bad news - Syanna was out to kill you," then wait for the trial to start. "You were children then, both,"
The bad ending is very easy to achieve. If you choose other dialogue options to those mentioned above or if you forget to read the journal then the bad ending is triggered. You can simply not bother to progress any of the side quests and not unveil the fifth victim to reach the bad ending conclusion. The alternate bad ending is based on a similar route to the good ending but with one key event missing. The trigger is forgetting to buy Syanna's ribbon from the flint girl vendor during the main story. Based on this mistake, it becomes impossible to convince the Duchess of the real truth about her sister right at the end. Ending 1: The sisters forgive each other and all is well. Right Dialogues/actions. Ending 2: A very sad ending. Both sisters die with Syanna stabbing her sister and then getting a crossbolt to the neck for it. Wrong Dialogues/skipping actions. Ending 3: If you forget to purchase the ribbon from the flint girl vendor, when the time comes to fight Dettlaff, Syanna will not disappear to Fablesphere. Dettlaff will kill her and you have the chance to spare or kill him afterwards. When all is done, you will come to see the Duchess mourning her sister and she will not believe you even if you tell her she was the next target.